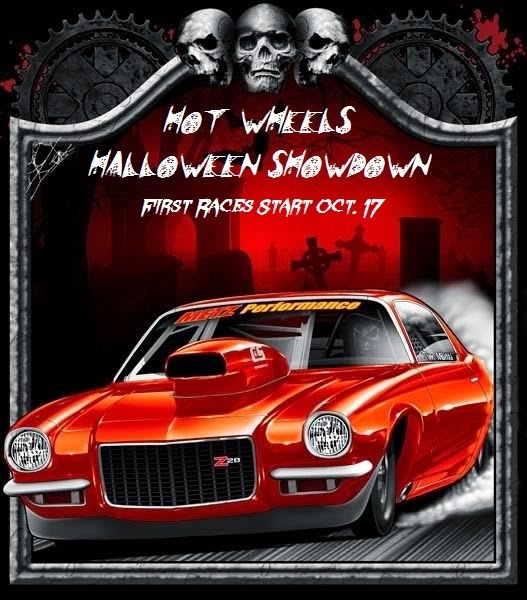 Hey everyone, get ready for the "Hot Wheels Halloween Showdown". 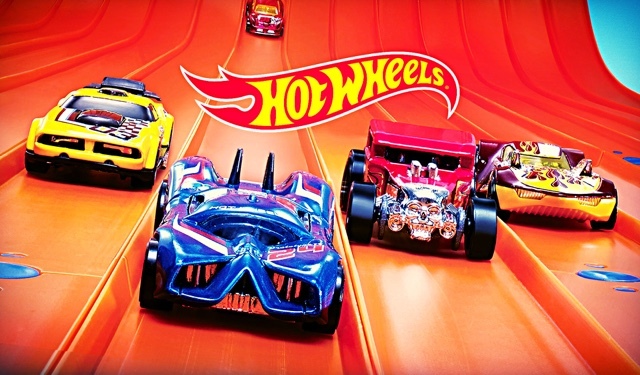 It will be a 64 car March Madness like tournament where you can fill out your bracket, predict a winner, and win a "Hot Wheels Racing Club" T-shirt. First round races will be posted on October 17th and 18th. Second round races will be posted on October 19th and 20th. The Sweet Sixteen will begin on the 24th and continue on the 25th. The Elite Eight will be posted on the 26th and 27th. 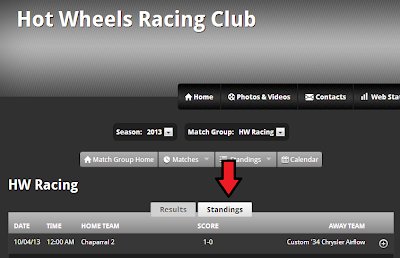 The Final Four will be posted on October 30th and the Championship race will be posted on October 31st, Halloween! 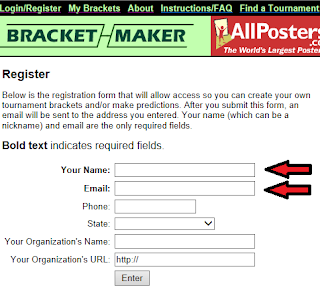 For this tournament we will be using the site Bracket-Maker. 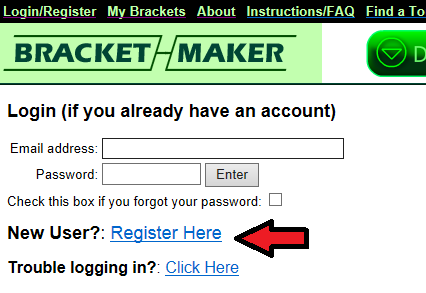 In order to fill out a bracket, you will have to register on the site. This can be done by entering your email address. I'll walk you through the steps. It will be super easy. 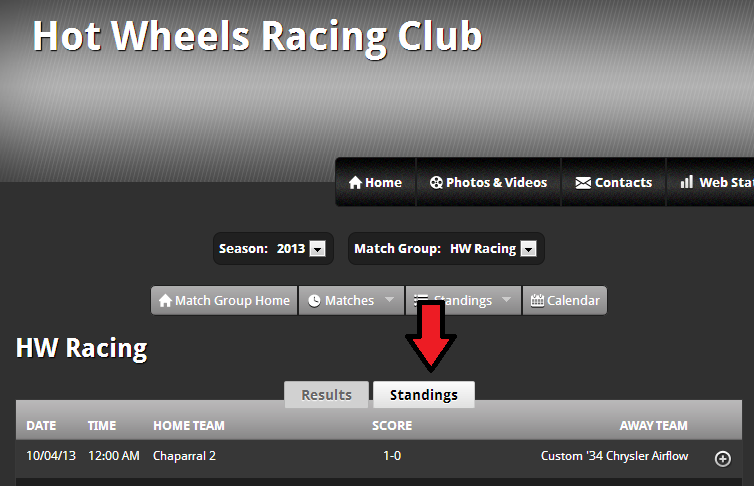 Click on the "Standings" tab to see how the cars have done. 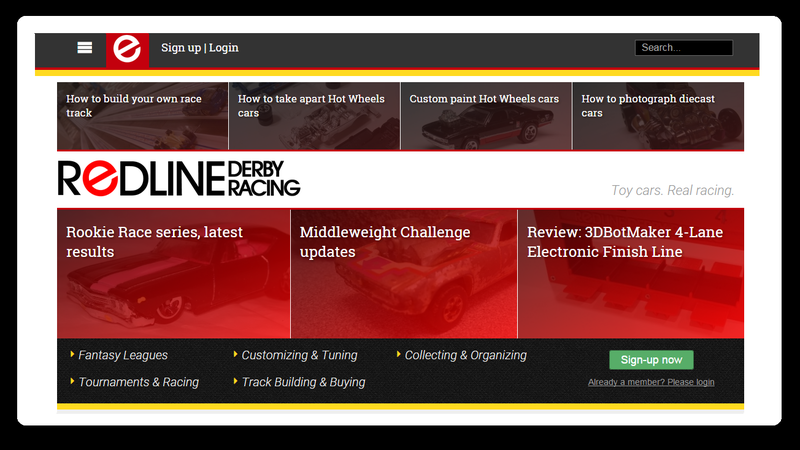 Click on the name of the car to see which cars it has raced and whether it won or lost. I always recorded the winning car as the home team to make it a little easier to read. 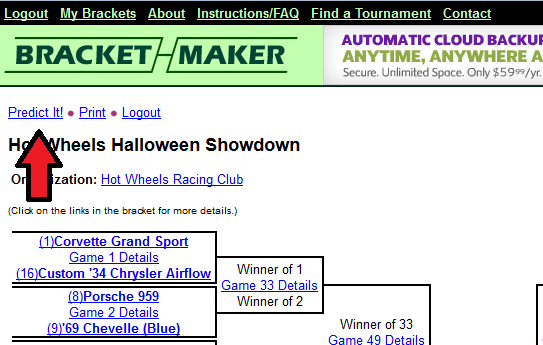 Also, each car's page has been linked from the bracket, so while looking at the bracket you can just click on a car to see it's record. 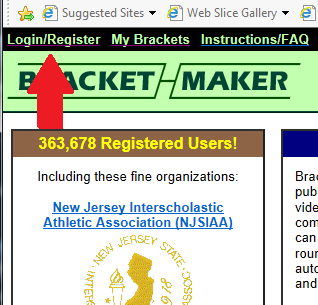 As mentioned before we will be using Bracket Maker for the bracket. 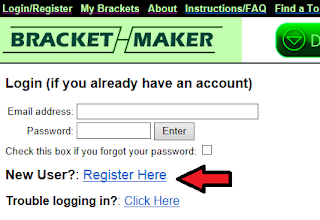 Here are some steps to register and start making predictions on your bracket. 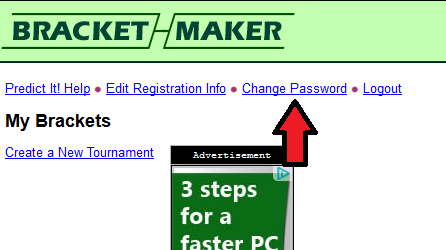 Step 1: To Create an account, click on the "Login/Register" link at the top right. 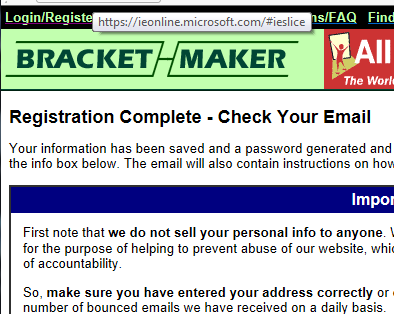 Step 2: Next click on the "Register Here" link. 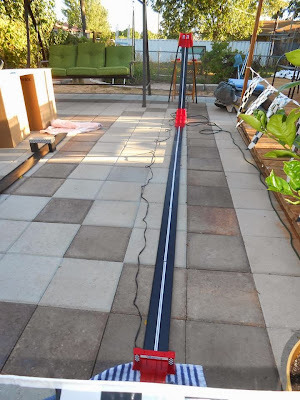 Step 3: You will now need to put in your name and email. There are some other fields for information, but those are not required. Step 4: Once you have put in your name and Email address, you will see a message that says to check your email for a conformation email. Check your email and find the one just sent from Bracket Maker. If you don't see it, check your junk folder. There is a good chance it will be sent there. The email will have a link. Click the link. 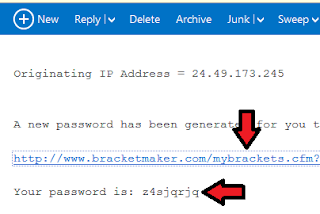 Also note the password that is included in the email. There will be a chance to change this later. 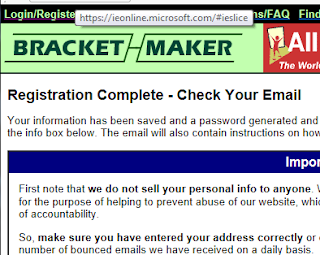 Step 5: You are now registered and logged in. At this point you have a few options, one of which is to change your password if you want. 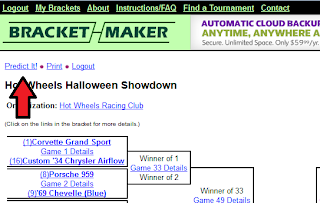 Step 6: To get to the Hot Wheels Halloween Showdown Bracket, copy and paste the following URL into your browser or click on the link. Step 7: You should now be on a screen that looks like the following picture. Click on the "Championship Bracket" link to see the bracket. Step 8: Click on the "Predict It" link to start filling out your bracket. 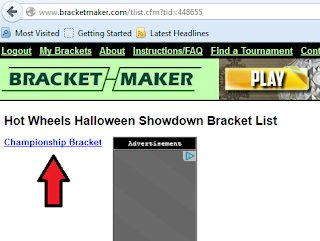 Step 9: After you make your 1st Round picks make sure you go down to the bottom left of the page and hit "ENTER" You will need to finish your entire bracket this way. This is an upfront Bracket. That means you need to have all your picks up to the Championship before the deadline is over. October 16 is the deadline.